Also for lawyers interested in the politics of the Foreign Corrupt Practices Act and why its chances for amendment on Capitol Hill are dim. Main Justice Editor-in-Chief Mary Jacoby, a Washington, D.C., veteran reporter, will offer the unvarnished perspective of a journalist covering the FCPA. Former Justice Department Fraud Section Chief Steve Tyrrell will explain enforcement. Navigant Consulting Inc.'s Ellen Zimiles will give the forensic investigations perspective. Other topics: corporate prosecutions; corporate internal investigations; deferred prosecution agreements and corporate monitors; and the political fight being wage to clarify FCPA definitions such as "facilitation payments," "foreign officials" and "successor liability." 2012 saw many important developments in the Foreign Corrupt Practices Act, from the first announced prosecution declination to new M&A anti corruption due diligence requirements, and capped off by new guidance on the FCPA from the U.S. government. Presented by Paul Hasting LLP's Timothy Dickinson, one of the longest-practicing members of the FCPA bar. He is joined by partners Palmina Fava and Morgan Miller. Anti-corruption Monitoring is an essential element of an effective anti-corruption compliance program. Professionals from Ernst & Young LLP's Fraud Investigation & Dispute Services practice will provide a practical guide to designing and implementing a monitoring program to enhance anti-corruption compliance in your organization. The ability of global organizations to properly anticipate, detect and deter threats will be crucial to establishing and maintaining effective anti-corruption programs in the current global economy. Ernst & Young LLP's Fraud Investigations and Dispute Services practice will provide practical guidance on incorporating forensic data analytical tools that incorporate statistical analysis, data visualization and text mining into your compliance monitoring program. The 2012 election will be the first presidential campaign taking place after the Citizens United Supreme Court case overruled previous campaign finance law limits on organizations' ability to participate in election activity. Despite this positive ruling for corporations ans associations, various rules and pitfalls exist for those who want to get involved in the political process. This webinar will help you prepare your organization for the 2012 cycle by reviewing topics such as the legal landscape for campaign finance, PACs and C-4 not-for-profit corporations, fundraising and disclosure, and rules for industry associations. With the widely-reported increase in FCPA enforcement by the US Department of Justice and the Securities and Exchange Commission, and the new UK Bribery Act recently taking effect, corporations are increasingly required to conduct anti-bribery due diligence and investigations across the globe. Yet EU data privacy laws often seem to be in direct conflict with US regulator’s expectations for credible investigations. Complying with US and EU requirements can require creative solutions and a strategic legal and technical partnership to gather and review the necessary data and documents. • Best practices from a recently completed European investigation. The recently released Dodd-Frank rules on whistleblowers will impact how allegations of federal securities law violations are reported, reviewed, and investigated and require corporations to consider compliance program changes to meet the challenges created by the new incentives and protections. From whistle blower allegations, government inquiries and subpoenas, to corporate due diligence, Foreign Corrupt Practices Act (“FCPA”) violations, and financial fraud – corporate counsel must collect and produce greater amounts of data from around the globe. Besides basic logistical issues, various tiers of data privacy restrictions complicate the process, requiring an in-depth knowledge of data storage technology and practices, multinational data transfer regulations, and general e-discovery best practices. For example, if data is required in response to a regulatory request in the United States, yet the custodians are based in France and Germany, how can the data be collected and reviewed in a defensible manner in compliance with EU as well as French and German data privacy laws? This program will outline the key considerations and best practices for collecting and assessing data in a defensible and secure manner. "Negotiating with the DOJ: Strategies for Optimal Results"
- What it means when the DOJ is involved. - Do's and Dont's for corporate counsel and executive officers. - Key motivators and concerns of the DOJ in any investigation. - How to leverage use of legal counsel to gain the best outcome. - The value of compliance programs and internal investigations in your negotiations. This channel is run by Main Justice, a Washington, D.C.,-based legal news publication covering white collar law enforcement, the U.S. Department of Justice, the Securities and Exchange Commission. Our free Main Justice site focuses on the politics and policy debates surrounding the DOJ. 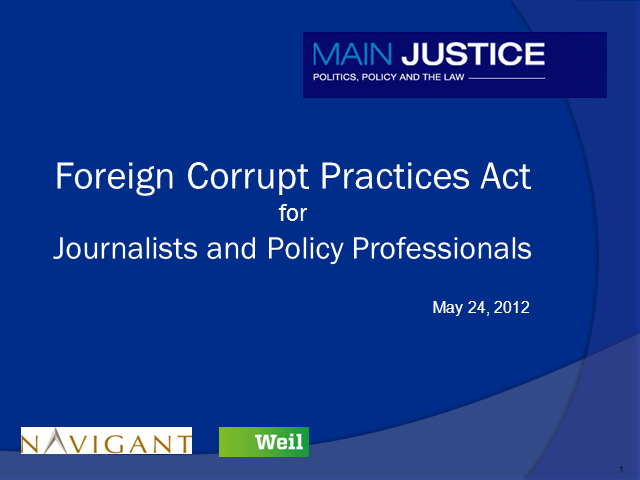 Our subscription Just Anti-Corruption publication covers the Foreign Corrupt Practices Act and the U.K. Bribery Act. Please visit us at www.mainjustice.com or www.justanticorruption.com.